The South Yorkshire Superheroes have received major backing from the National Lottery Awards for All grants scheme for a project described as “magical”. 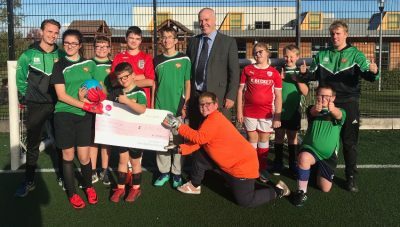 NLY Community Sport, the organisation that runs the Superheroes, has received £8,130 from the National Lottery to grow Disability Football in Barnsley for children with disabilities and learning difficulties. 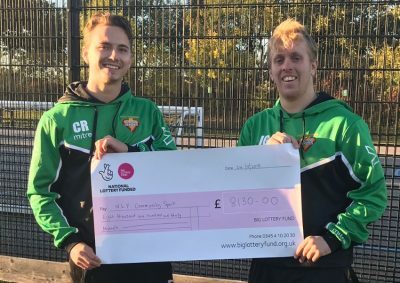 The not-for-profit organisation – led by young coaches James Grayson and Connor Rollinson – successfully applied for the grant from the Big Lottery Fund and the cheque was presented by Springwell Learning Community executive principal David Whitaker. The Superheroes train at Springwell every Monday between 5pm and 6pm. Mr Whitaker said: “It is about participation and the fact that Connor and James are getting out of school participation from kids who otherwise would not participate is just magical. “As a school, it is great that it here at Springwell. We want our Springwell children to be part of the project, as well as the community of Barnsley. “Any contribution that the National Lottery can make is fantastic because it is creating opportunities. “Connor and James are creating opportunities, not just for our children, but all children in the community. The Monday Barnsley session was set-up in February and has quickly grown. The Superheroes also recently competed at their first competition – finishing second at the annual Bradford Tournament. As well as advertising in the local community, NLY Community Sport will also work with schools to receive pupil referrals for anyone who will benefit from the football training. Cudworth-based Connor, 25, who also plays for local side Worsbrough Bridge, said: “Being a Barnsley lad I’ve wanted to give something back to the area for a long time. “This grant will help us grow the Superheroes in a steady and sustainable manner, whilst also continuing to achieve our goals. “We firmly believe the Superheroes will help those children with disabilities and learning difficulties increase their confidence, improve their social skills and establish life-long friendships whilst playing and training with us. “The Superheroes will integrate people into the community in a really positive way and also address issues at an earlier age. “We can’t thank the National Lottery enough for believing in us and seeing the potential of our project. NLY Community Sport currently works in partnership with Pontefract Pirates, Nostell Miners Welfare and Inspiring Healthy Lifestyles (Selby Leisure Centre) to run Disability Football sessions. 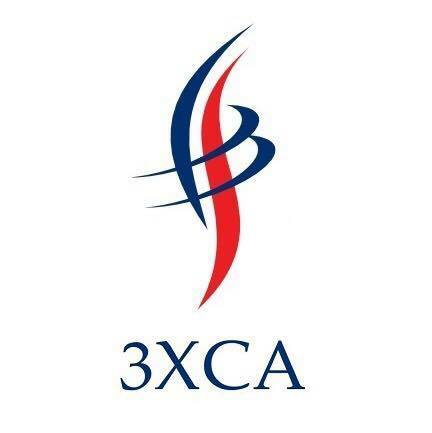 The organisation provides sporting opportunities for adults and children with disabilities and learning difficulties as well as mental health issues or have complex disabilities. 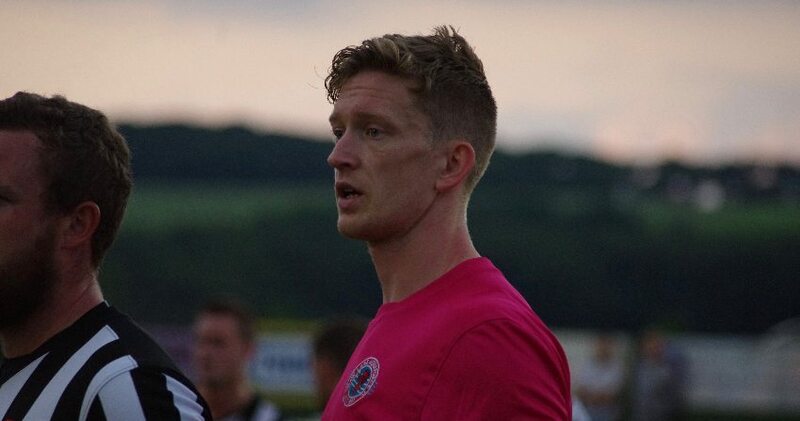 James added: “Myself and Connor are absolutely delighted to have received the grant from the National Lottery. “NLY Community Sport has already achieved a lot in just 12 months as an organisation. To learn more about NLY Community Sport’s work, visit their Facebook page or their webpage.